Ganglion cysts arise from two main causes in the feet. These cysts are filled with synovial fluid, which is one of our body's natural lubricants that is present in joints and also surrounding tendons to help them glide while moving. The synovial fluid is normally contained entirely within the joint, but in some cases (especially when joint motion has been compromised) an out pouching of the tissue containing the fluid can fill and become what we refer to as a ganglion cyst. Anatomically speaking, these cysts have the gross appearance of a small water balloon. As mentioned earlier, a similar scenario (out pouching of synovial tissue) can occur near tendons - though this is less common. 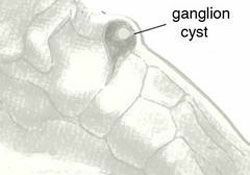 Ganglion cysts have been around for a very long time and some of the earliest treatment involved hitting the cyst hard with a bible (or another heavy book) and this would reduce the cyst. Essentially, this method would rupture the 'balloon' holding the synovial fluid and the fluid would disperse and be re-absorbed into the body. Now these cysts are more often treated by aspiration (removing the fluid with a needle) or surgical excision. These cysts tend to recur, especially when treated through aspiration or simple excision, as the root cause of the problem (the joint dysfunction) has not been addressed. As aspiration can be performed in an office setting and poses a much lower risk, it is a reasonable first line of treatment. In addition, aspiration allows the doctor to have the fluid evaluated to ensure the indentity of the cyst and rule out malignancy. In cases where these cysts recur, it is important to consider addressing the joint or tendon dysfunction to reduce the predisposition to creating these cysts. This is especially important to consider if the tendon or joint itself is symptomatic. If you have a bothersome bump on your foot, come in and see one of our doctors! Identifying this lesion and confirming it is benign is the most important step in treatment.